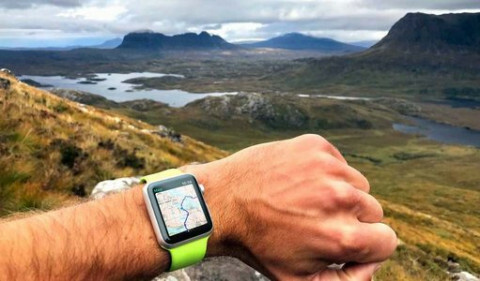 Finding exciting places to hike is now easier than ever thanks to a new smartwatch app from ViewRanger that lets you locate and download the best outdoor routes near you. ViewRanger for Apple Watch pinpoints your precise location and displays up to 10 routes near where you’re standing, so all you need to do is pick the route guide you want to explore then download it directly to your watch. Without even taking your phone out of your backpack. So whether you’ve just pulled into Yosemite Valley’s trailhead parking lot, Grasmere village in the English Lake District, or even more out-there locations like Jungle Lodge Farm in Vietnam, you can discover adventure near you with a glance at your wrist. Once your route and maps are downloaded simply tap start, then let ViewRanger’s GPS navigation guide you along the trail. And that’s not all. ViewRanger’s new Apple Watch app – available now as a free update in the App Store – lets you view your maps in full-screen mode with a simple tap on the map. And as well as zooming, you can now pan the map by swiping your finger across the screen to view even more of the area you’re exploring. All of the existing features from ViewRanger’s previous Watch app are still included – such as offline maps, track recording, distance and elevation gain stats, driving directions to your route’s start point, and much more. This new version of ViewRanger works with all models of Apple Watch when paired to your iPhone via Bluetooth, and works independently of your iPhone when using built-in cellular connection on the new Apple Watch Series 3. ViewRanger works with a fast-growing network of more than 600 publishing partners around the world – including Backpacker magazine, Julia Bradbury’s The Outdoor Guide, BBC Countryfile, the Italian Alpine Club, the UK’s Camping and Caravanning Club, and National Parks. This latest smartwatch release is a further indication of ViewRanger’s dedication to making those route guides more discoverable and accessible to millions of explorers around the world. For more details on publishing routes with ViewRanger, click here.